As a modern parent have so many options on how you want to have birth, raise your child and how you care for them. The best thing you can do is educate yourself on all the options and then go with what your partner and you feel comfortable with. 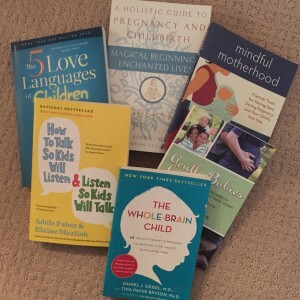 The worse thing you can do is not do your homework, here are my MUST READS for all moms and dads. 1. Holistic Guide to Pregnancy and Childbirth magical beginnings, enchanted lives by Deepak Chopra M.D. I love this book for so many reasons. Its broken down into chapters that always have an exercise to try and I appreciate actually being able to practice what I read. It goes from a range of topics in childbirth to the stages of childbirth to tools to use beyond childbirth. Highly recommended. If you are into essential oils and natural remedies this book is perfect for childbirth, infants and young children. Packed full with solutions and recipes to use aromatherapy and essential oils to heal. A must have in my opinion. 3. Mindful Motherhood by Cassandra Vieten, Ph.D.
Mindfulness is not easy and child can sure test anyones patients. This book helps you develop or reminds you to be mindful not only through your pregnancy but in motherhood. It’s an easy read and very enjoyable. Probably one of the best children books on how to raise child and be a good parent. Highly Recommend. Just like the original book on the 5 love languages this one is written in the context of children. If you have never been introduced to the 5 love languages, its a wonderful read that will help you better understand not only how your children feel love, but also those around you. 6. The Whole-Brain Child 12 revolutionary strategies to nurture your child’s developing mind by Daniel J. Siegal, M.D & Tina Payne Bryson, Ph.D. So simple and smart this book is. Another one of my top picks for best parenting books. If you do have a child who struggles their are great solutions in this book. This book focuses on healthy brain development. Highly recommend! There is A LOT of controversy with vaccines right now in America, especially California. This book is a non- politically charged look at all the vaccines that are out there, the makers, what they are for, when they are given, possible affects and suggestions on if you choose to give to your child or not. You should know why and what you are giving your child so I feel every parent should read this book. The neat thing is if you like this Author and Doctor he is still practicing in Southern California and accepting new patients.